USB Device Share lets you share USB devices and access them remotely over network (LAN or internet). 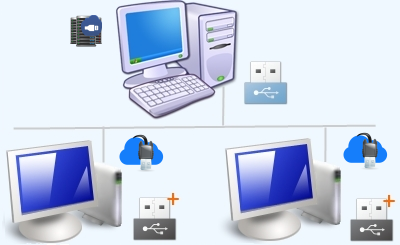 Using this software, USB devices connected to remote computers can be accessed as if they are locally plugged in. Applications which work with the device can then be run without the device being locally present. USBDeviceShare supports only Windows operating systems. Access USB devices remotely. Run applications which work with devices remotely. Unlimited number of devices can be shared and remotely accessed using registered/full version. Share all types of USB devices - storage, HID, audio/video, dongles, card readers, vendor specific devices etc. Share USB devices using software technology. No additional hardware required. USB Device Share is a USB over Ethernet / USB over Network software. It is a 100% software solution to access USB over network (USB over IP). USBDeviceShare supports all types of USB devices : USB 1.x, 2.0 and 3.0 devices (low, full, high & super speed). Supports all versions of Windows operating system. Supports both 32 bit and 64 bit Windows Editions. We offer 15 days money back guarantee for USBDeviceShare, Free support and Free upgrades for 1 year. Contact us at support@sysnucleus.com. 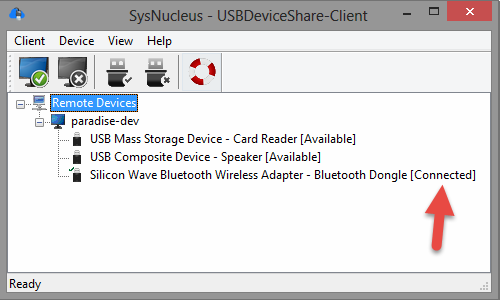 We recommend that you download and try the free evaluation copy of USBDeviceShare to learn more about the features. With USBDeviceShare you can connect to your USB devices remotely over network/internet. This helps to access devices which are not easily portable. Your device which is physically present at your home or office is safe and secure. Share expensive USB devices with members in your organization. No need to purchase additional hardware. Use USBDeviceShare to share devices over network and cut down expenses. All types of USB devices like scanners, printers, communication devices, storage devices, human interface devices, video, audio, vendor specific devices etc. can be shared and accessed. Devices can be set up to be automatically shared as soon as they are plugged in or during server startup. There is also an option to share all newly plugged in devices. To prevent users from accidentally sharing a device which should not be shared (for example the system's primary USB mouse or keyboard), the 'Deny sharing for this device' feature can be used. IP Filters can be used to block or allow only selected clients in the network from connecting to USBDeviceShare server. 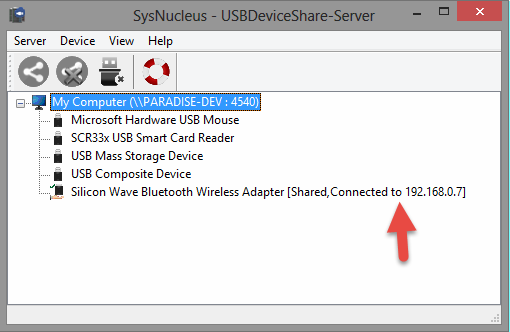 USB Device Share Client supports callback connections from the server. This feature is useful when the server is behind a router or firewall and cannot accept incoming connections. USB 3.0 (Super Speed USB) devices can be shared and remotely accessed using USBDeviceShare. Install USBDeviceShare-Server where devices are present. Install USBDeviceShare-Client where devices need to be remotely accessed.